The Erie County Bar Association polled its membership to rate judicial candidates. The judgements may suprise you. The Erie County Bar Association polled its 465 active members during February and March to rate the eight candidates who filed nominating petitions to run for two open seats on the Erie County Court of Common Pleas resulting from the retirements of Judge Shad Connelly and Judge Ernest J. DeSantis. Members of the Bar Association were asked to rate the eight candidates, of whom all but one have cross filed as Republicans and Democrats. Former State Senator Anthony "Buzz" Andrezeski is the only candidate to file only as a Democrat. There were two rounds of polling, the first to rate the seven candidates who announced their candidacies in January and February, and a second round that gave the membership an opportunity to rate Adrezeski, who filed to run on the Democratic ticket just before the March filing deadline. 314 ballots were returned in the first round of polling and 288 attorneys participated in the second poll. "The Erie County Bar Association conducts a plebiscite each year when there is an election for a Common Pleas Court judgeship. We hope that the information is helpful to our community because individual attorneys are in a unique position to provide input on the candidates' respective qualifications for the important position of Judge," said ECBA President Richard A. Lanzillo. Individual attorneys were asked to rate the candidates in one of four categories: highly recommended, recommended, not recommended, or no opinion. 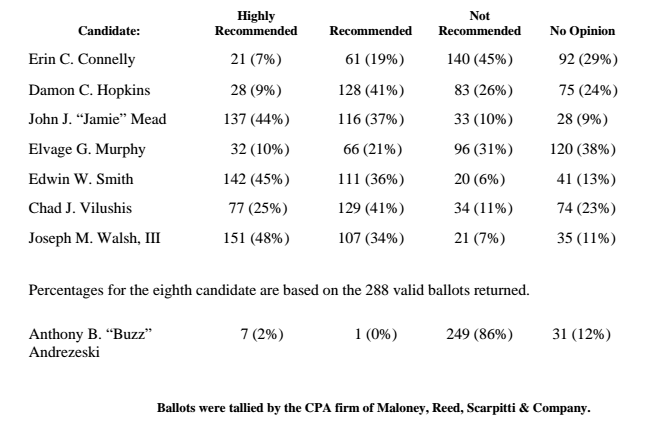 Attorneys Ed Smith, Joe Walsh, and Jamie Mead were the most highly recommended by their peers, with Chad Vilushis a close fourth. Damon Hopkins was recommended by 41 percent of respondents, however 50 percent of those polled either didn't recommend or had no opinion on Hopkin's candidacy. More than 70 percent of respondents also didn't recommend or had no opinion on the candidacy of Erin Connelly, whose name recognition is expected to be a factor in the May 19 municipal primary. Edinboro University professor and attorney in private practice, Elvage Murphy, carried the greatest number of no opinion responses, which could be attributed to his comparatively low public profile among a host of recognizable names in the legal community. 86 percent of respondents in the second poll did not recommend Andrezeski's candidacy. It's important to remember that this poll is only a small subset of the voting population, but it is a particularly motivated voting bloc in this municipal primary. 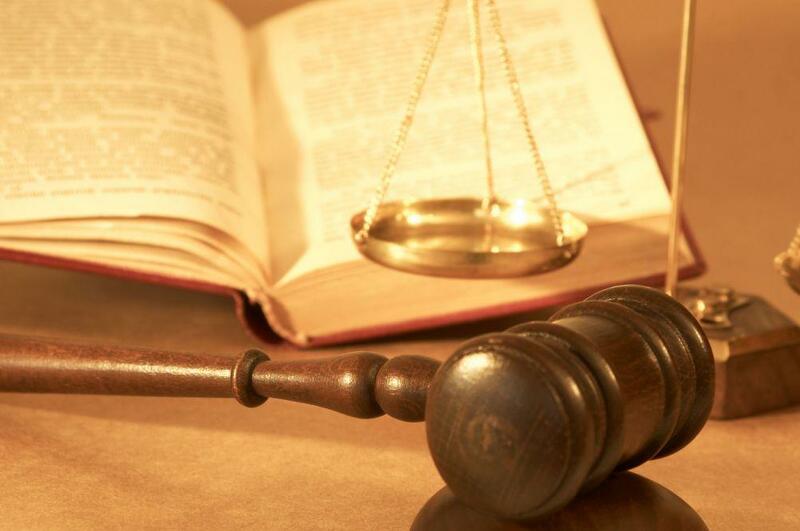 The four front runners in the Bar Association poll could potentially split the primary votes, keeping any candidate from holding down both the Republican and Democratic ballots in November. If that happens, we could be in for a rather boisterous and expensive general election campaign.